KnowledgeWorks releases guide to help states and districts re-imagine teaching and learning under new federal education law. It's important to have these conversations now, in preparation for high-quality ESSA implementation. Amid sluggish education outcomes, increasing need for remedial college coursework and a prevalent job skills gap, the Every Student Succeeds Act (ESSA) marks an important point in federal education policy. 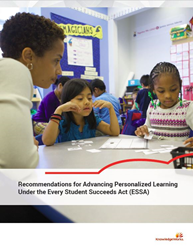 KnowledgeWorks also created a side-by-side resource, which compares NCLB and ESSA through a personalized learning lens. This resource was released last week during South by Southwest's education sessions (SXSWedu).